Distance 4.4 miles (7.0 km). Grid reference SW666180 to SW685133. Park your car next to the Mullion Cove Hotel. Walk to the cannon overlooking Henscath, Scovarn and Mullion Cove Harbour. Walk down from the car park passing two seats. Take the coast path as indicated down to the harbour, your descent made easier by simple steps. This should take about 10 minutes. As you leave the harbour, look for the coast path sign to your right. Walk up any of a selection of paths - depending on how close to the cliff edge you wish to walk. As you reach the top, pause a while to catch your breath near the 'Mullion & Predannack Cliffs Nature Reserve'. Look back to see how quickly you have gained height, indeed you should now be on a level with the Mullion Cove Hotel on the cliffs opposite. Proceed along the wide grassy path as it levels out. Look seaward for a good view of Toldhu - better known as Mullion Island. The dark rock of the island (Pillow Lava) stands out against the blue sea and the white breakers. A large white house appears down to your left. Continue on the track as it enters a small valley. Cross the stream at the bottom and then negotiate a stile as the path narrows. Go through a kissing gate as you pass the offshore rock known as the 'The Chair'. The path now swings almost 90° left as you pass Mên-te-heul Point. Now about 45 minutes into your walk, the striking headlands of Vellan Head and Kynance Cliff come into view for the first time. Pass Pedn Crifton on your way to Predannack Head. The path runs parallel with the contours for a while as it enters NT property, before veering 90° left again above Ogo-dour Cove. Look for the narrow path down the slope, taking a few minutes out to look seaward at the waters interaction with the cliffs and caves. Even on a relatively calm day the sea seems to boil in this 'Cove of the Waters'. After reaching the small grassy area below why not look for a good place to have a picnic. Refreshed, cross the stream and begin to climb up Lower Predannock Cliff. At the top, look immediately to your right to see a NT signpost nestling in the hedge. Shortly, the path enters a large flat area of bracken as it passes above Pol Cornick. 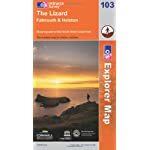 Read the English Nature sign at Kynance Farm - 'The Lizard National Nature Reserve'. In places the ground is a bit boggy, take care. As you reach Vellan Head you have a choice of walking around the Point, some 230 feet (71m) above the sea, or cutting across its neck in a straight line. Both paths join and run close to the cliff edge as you pass Ogo Pons. You should now be about 2 hours into your walk and just above the spectacular cleft of Gew-graze. We stopped here for a drink before walking up the valley, over Predannack Downs, and back to our car at Mullion Cove. A lot of people wonder where the name 'Mullion' comes from. Well there is some debate over this. Some say that the cove was originally called 'Porth Mellin' which is Cornish for 'Cove of the Mills' as there were three mills working there. Another explanation is that the word is a corrupted form of St. Mellanus - a 5th Century missionary from Rennes in Brittany - although Mullion Church was not built for another 700 years. Which explanation do you believe? Take some time out for refreshment at Gew Graze and to look around at the scenery. On our visits we have always found this place to be quite tranquil. Cross the stream by the stepping stones and commence your climb away from the inlet heading south. Take care up the slope, especially in wet weather, pausing part-way up to look back at the small waterfall, caused by the small stream tumbling into the Soapy Cove below. The reason that Gew Graze is known as Soapy Cove is a geological one. There was (in the mid 1700's) quite a large quarry on the Mullion side of the cove extracting Steatite (or Soapstone) - a soft rock used in the process of Porcelain manufacture. Shortly, you pass the inlet of Pigeon Ogo with its cave (visible only from the sea) and dramatic dark cliffs dropping sheer to the sea. Follow the somewhat indistinct path as it bears almost 90°. Incidentally the cliffs here above the Rill Ledges are famous for being the place from which the Spanish Armada was first sighted on 29th July 1588. The path runs easily along the flat 60m (200 feet) cliff as it passes the narrow headland known as The Horse and the small inlet known as The Pound. Great news for bird lovers: The Cornish National Bird - The Chough has recently nested on cliffs near here. Continue due east along Kynance Cliff before bearing 90° left at Rill Point. Follow the path with care as it passes the Nature Reserve of Kynance Farm before dropping down the grassy slope. Follow the obvious path down to the cove taking care on the slippery serpentine rock if it has been raining. The colour of the rocks being greatly enhanced when made wet by rain sea or after polishing. Many times I have picked a beautiful red or green pebble from this cove only to find it loses its beauty when dry! There are a couple of paths as you meet the cove - one being the high water route up to the car park above Kynance. There are usually refreshments available at the cove if in season. NOTE: If you arrive at high water, please try and wait around for low water to really catch this cove at its most picturesque. There is a great choice of cottages for rent in the local area. Take a look at the beautiful cottages in Gunwalloe, Lizard, Cadgwith and Helston.